England won their first-ever World Cup penalty shootout in their Round of 16 match against Colombia in Moscow on Tuesday, July 3. Check out how Twitter reacted to the historic feat from the Three Lions. 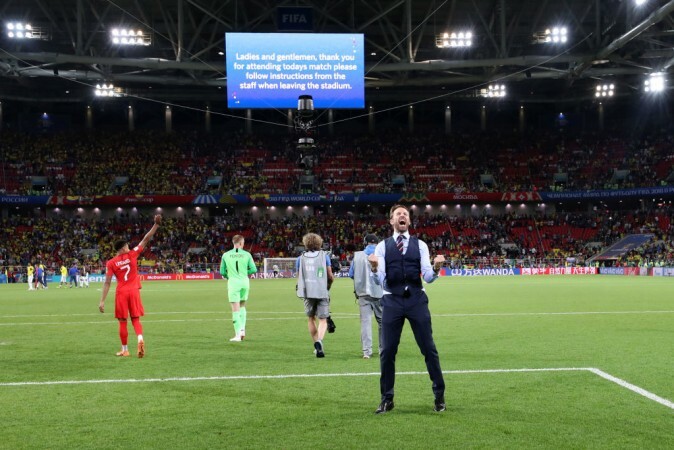 England created World Cup history on Tuesday, July 3 in Moscow when they defeated Colombia 4-3 on penalties to reach the last-eight of the ongoing edition of the quadrennial tournament. The Three Lions had never won on penalties at a World Cup and had lost six of their last seven shootouts at major tournaments until Tuesday. They had been eliminated from World Cups thrice (1990, 1998 and 2006) on penalties and had suffered a similar fate not once but thrice in European Championships as well — 1996, 2004 and 2016 despite having had squads filled with superstars. Questions about a possible penalty shootout situation were inevitable during the pre-match press conference attended by coach Gareth Southgate, who himself had made a costly error from the spot at Euro 96. Southgate insisted that his young bunch had been working on taking kicks from the spot in the lead up to the World Cup. The former England international had even psychologically profiled players who were potential penalty takers, according to reports in the British media. The results showed on another nervous night in Moscow as four of the five English players converted from the spot. Liverpool's Jordan Henderson was the only player to miss following a wonderful effort from Colombian shot-stopper David Ospina. Earlier in the evening, England were heading towards a win in the normal time after Harry Kane's goal from the spot in the 57th minute. However, Colombia's Yerry Mina scored an injury-time equaliser to force extra-time, which ended with the deadlock unbroken. Emotions were running high and the English players had a psychological battle to win when the match went to the penalties. Colombian captain added to the pressure by taking a wonderful penalty but his English counterpart stepped up and delivered. Henderson's miss came after Juan Cuadrado, Marcus Rashford and Luis Muriel made no mistakes. Just when England were trailing 3-2, Colombia's Mateus Uribe rattled the crossbar from the spot after which Trippler successfully converted. More agony came Colombia's way when young Jordan Pickford came up with a brilliant save to deny Carlos Bacca. Eric Dier then scored, giving the English fans the much-needed relief and joy. The Three Lions had made it to the quarter-final of the World Cup for the first time since 2006. IBTimes, India has compiled a list of reactions to England's historic win on penalties. Check them out below. Can't believe I just watched England NOT go out of the World Cup on penalties. Have they no respect for tradition? ? How good was that!! Our penalties were awesome ???? Imagine losing to England at penalties. Right I need to check..
Did anyone else see #ENG win on penalties? Whole England holding their breathe. The whole world just waiting to tell jokes about England and penalties. Enormous pressure on the players. And they just look SO concentrated. So sharp. Jordan Pickford has been an England squad member for only 8 months and he just played a fundamental role in winning England its first ever World Cup penalty shoot-out. Christmas 2018: Fascinating things the world did on the day Christ was born! Game of Thrones star Maisie Williams' friendship with Sophie Turner was a destructive influence?